The "SHAHZADA 400km Memorial Test" endurance marathon ride is on again. With its motto "To Finish is to WIN" this ride is not for the faint hearted. 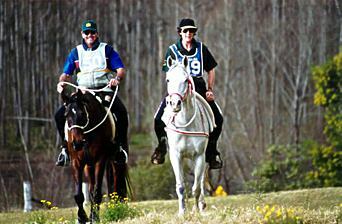 The Shahzada is, for many Australian endurance enthusiasts, the pinnacle of the yearly ride calendar. 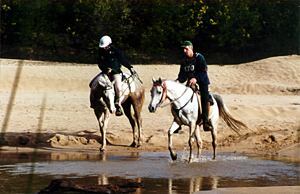 Known as the "Ultimate Endurance Test" it takes a special horseman and horse to complete this gruelling marathon ride, and many prepare for their yearly pilgrimage to the small hamlet of St Albans (located in the McDonald Valley on the Hawkesbury River, North West of Sydney). True Australian endurance country beckons. The mountains of Yengo National Park, the rocky steep hill climbs up the St Albans" valley walls, clambering over boulders, steep and testing hills with names such as "Prestons Hill" and the "The Steps" - true tests of horsemanship and horse. 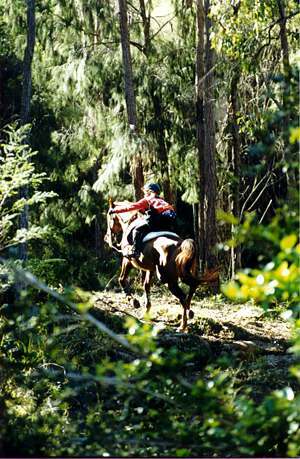 These coupled with river crossings, fire trails, bush climbs and descents, this marathon ride is not for the amateur rider or novice horse. The marathon ride itself is named in after a very famous horse. Reputed to have great heart and stamina, Shahzada was a purebred Arabian stallion imported to Australia from England in 1925. In endurance tests, Shahzada had few peers. Tests were held in 1920, 1921 and 1922 over 250, 300 and 500 miles. Each ride was held over a five-day period. Shahzada won the first and third tests and was second over the 300-mile distance. It is reported that he covered this distance in 37 hours and 29 minutes riding time, carrying 14 stone. On two other occasions Shahzada won mile races carrying 10 stone. On yet another occasion he was able to win a seven furlong race in open company two weeks after winning a 310 mile Endurance test. Shahzada was imported to Australia by Mr A.E. Grace, a Sydney businessman and pastoralist, to stand at stud on "Woodlands Grace" station near Denman in NSW. In his later life the horse was bought by Mr R. M. Williams of "Booralong" station, "RM" being one of the founders of the famous Australian Quilty 100 mile endurance ride. Today the 400km Shahzada marathon ride is held over five days, 80km a day. It is hard on the horses and hard on the riders. It may not be the 500 mile distance the horsemen completed in 1922 but today it represents the longest endurance ride in the world. There are twice daily vet checks which are extremely stringent as the horses" welfare is of the utmost importance. This year is the 21st year for the running of the Shahzada with pre-entry a necessity. In 2000 riders came from New Zealand, the Britain and the UAE to complete in the marathon ride with many onlookers from UAE, Malaysia, Japan and Europe. In 2000 the total number of entries was 129 in the 400km test. This year there are already well over 100 entrants. Hawkesbury River ... two riders approach "Jo's Crossing". The winner in 2000 was a Scotsman, Philip Haworth, riding his eight-year-old purebred mare Sawaan Rose. They completed the course in a time of 30 hours 1 minute. The almighty horse "Falah" (Ralvon Reflex), now owned and ridden by H.H. General Sheikh Mohammed Bin Rashid Al Maktoum, won this marathon ride in 1999 and claimed the best managed horse award under the guidance of then owner/rider, Jennifer Gilbertson. It takes a special breed of horse to complete a 400km marathon ride and stay sound, and considered by vets ready to go out again. And "Falah" is a very special horse. He had placed for Australia in the UAE World's Most Preferred Ride in 1998, and previously with Jennifer he completed, placed and won many endurance rides at home in Australia prior to his export to the UAE where he has continued on in his winning ways under the guidance of H.H. General Sheikh Mohammed Bin Rashid Al Maktoum. His latest victory another win at the 2001 Al Ahram, Egypt. Camille Alexander and her stallion GG Vussja at the base of The Steps, where rainforest turns into a steep, rocky stepped vertical climb out of the McDonald Valley. The Shahzada is a unique ride, the only marathon ride of its type in the world -- for serious "marathon" riders only. 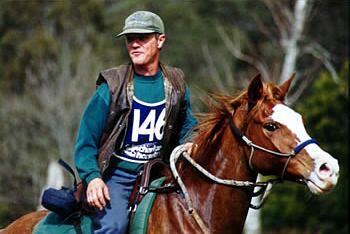 However, the competitive spirit among the leaders of the day is very much alive, and you will find some of Australia's best endurance competitors competing such as Terry Wood, who, riding Tallawarra Tommie, finished with second place in the 2000 event. The ride conditions can change from the heat of the day in the early 20s, to rain, and even sleet and hail which gave last year's riders and strappers a challenge. The weather can vary from day to day or even from hour to hour. These riders know their horses and bring whole support teams consisting of masseuses, their own farriers, and vets, strappers with strapping teams and camp cooks even family and friends to ensure they survive through to the end. The motto "to Finish is to Win" is evident to all that compete and attend as spectators. This is serious endurance and the motto is so true for everyone who completes this test of man and horse �- all are winners in the eyes of the Australian endurance community. To find out more about the Shahzada in Australia you can log onto the website www.shahzada.org.au or call Graham Gilbertson, on 61 245 664442, who is one of the ride management organisers.